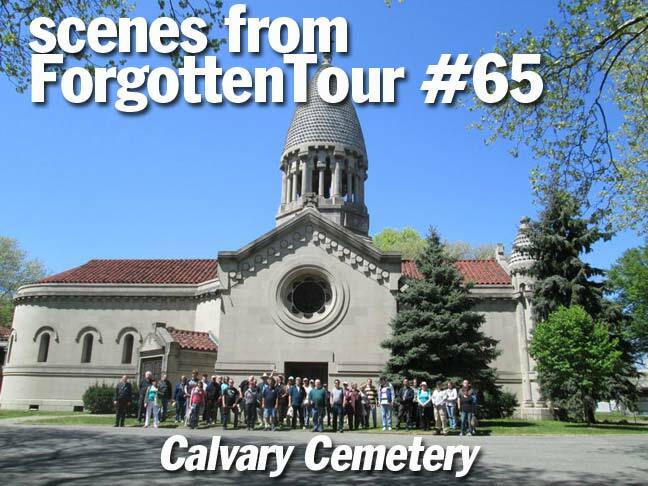 May 4th, 2013 continued the lengthy string of ForgottenTour sunny weather that had begun in 2012, as over 35 ForgottenFans were treated to pleasant 60-degree conditions for a walk in Calvary Cemetery, Queens. We stopped at about two dozen memorials, enjoyed terrific views of the Manhattan skyline and the Kosciuszko Bridge (which is slated for demolition and replacement by a new bridge by 2017, so its time is limited) and visited the early 18th Century Alsop family graveyard, which is surrounded by the newer Calvary. In the mid-19th Century Manhattan was getting so crowded (by 1845 the island was fully built up south of about 42nd Street) that it was running out of cemetery space. 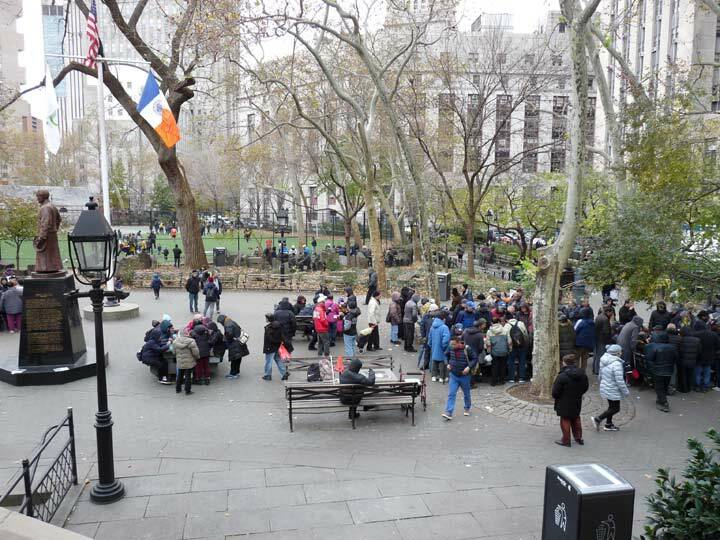 The two largest cemeteries had been developed by Trinity Cemetery, in the churchyard adjacent to its ancient Broadway and Wall Street location, and uptown in the furthest reaches of civilized Manhattan territory, the wild north of 155th and Broadway. In addition, a cholera epidemic was making continued interments in Manhattan a risky proposition. By the 1840s Brooklyn’s largest cemeteries, Green-Wood and Most Holy Trinity, and Woodlawn in the Bronx were accepting interments; and in Staten Island there was Moravian, developed in the 1760s, and myriads of smaller cemeteries. Queens, too, had dozens of tiny burial grounds scattered around, many dating to the mid-1600s. In 1847 the Rural Cemetery Act was passed, prohibiting any new burial grounds from being established on the island of Manhattan. Presciently anticipating the legislation, trustees of the old St. Patrick’s Cathedral on Mulberry Street in what is today known as Little Italy began buying up property in western Queens. Calvary Cemetery, named for the hill where Christ was crucified, opened in 1848. The original acreage had been nearly filled by the late 1860s, so additional surrounding acreage was later purchased to the east. The original Calvary Cemetery lies between the Long Island Expressway (formerly Borden Avenue), Greenpoint Avenue and 37th Street, Review Avenue and Laurel Hill Boulevard. New Calvary, in three divisions, is west of 58th Street (formerly Betts Avenue) from Queens Boulevard south to 55th Avenue. Smaller, pre-existing cemeteries were part of the original acreage, and were then surrounded by Calvary. Much of the information gleaned for this tour has appeared previously on the Newtown Pentacle, researched by the tireless Mitch Waxman; the Pentacle is the source of information for all neighborhoods and highlights surrounding Newtown Creek, including Calvary. For selected identified views of the tour, see this flickr page. Photos: Joe DeMarco. The Queens Times-Ledger wrote about this tour. It was a beautiful day! We almost went on your tour, which looks very interesting, but decided to find our relatives and friends buried in New Calvary instead. Eventually, after much treking and confusion, we found them and inadvertently parked in front of the grave of Michael J Spillane. Looked it up when we got home and it was indeed the final resting place of Mickey Spillane. He’s in New Calvary, section 17, midway up the road that runs parallel to Laurel Hill Blvd. I have a great Grandmother, Grandmother, and Uncle buried in Calvary Cemetery. Also, if you look closely, you might be able to find the burial scene location from the first Godfather movie. Don Corleone R.I.P. That is so true. I think some of my favorite parts of an inoiatigstevn are the not-hunting times when everyone sits around and tosses out theories, talks about possible experiments, asks questions about the universe in general. We get some conversations going that are so stimulating and exciting that we could talk to sunrise easily. Usually we’re so task oriented that we don’t connect about some of the things we should like how to tackle this particular hunt and adapt, how we should try something new the next time. It’s the bull sessions that get us all excited about what we do. Great post! You summed it up well.